Sony launched a next generation of its streaming players SMP-N200. It has sleek design and includes a full bunch of connectivity options – HDMI, composite, component as well as built-in WiFi adapter. Additionally to 1080p playback the player is ready for 3D content. The Sony SMP-N200 is oriented for Sony Entertainment Network, where you may find live streaming TV shows, movies, music and photos. Even in 1080p and 3D! Also the box supports DLNA. So, you’ll able to push media from your NAS, network shares, smartphones or tablets to playback directly to the Sony SMP-N200. Additionally it can be controlled via iOS/Android devices using free app Sony Media Remote. The Sony SMP-N200 will be available in October at $99.99. Apple hit the media community releasing the next generation of its Apple TV. It’s incredibly small and stylish as all Apple’s products. And it supports HD video and costs just $99! But many of us would like to compare it with a few others devices available on the market. At least briefly. Thanks to Engadget, we can do it. 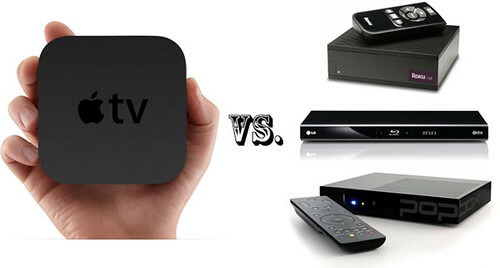 Competitors of Apple TV in that comparison are Roku HD-XR, Popbox, LG Blu-ray player BD550, PS3, Xbox 360 and WDTV Live. As you may see at there are at least two big disadvantages of new Apple TV – lack of 1080p support and impossibility to watch media from local non-Mac storage. Sure if you’re living in US and happy with online services such Netflix or iTunes the Apple TV might be a perfect choice for you. But even though think about Roku which offers for the same money FullHD support and more online services. 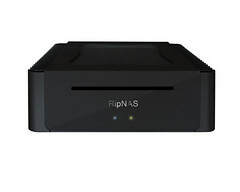 Recently the mCubed, well-known producer stylish small factor PC, presented its new device – RIPNAS. It combines Audio CD ripping, Network Attached Storage and Media Streaming in one easy to use small, quiet and fanless box. The CD ripping is fully automated and it doesn’t need user interaction. The metadata is retrieved 4 providers – AMG, GD3, MusicBrainz, freedb, with quality album art, spelling mistakes are automatically corrected using PerfectMeta technology. Ripped to a lossless format CDs are automatically shared for streaming for various network media players such Sonos, Logitech Squeezebox, uPNP/DLNA compatible players and iTunes DAAP. The RIPNAS is based on Windows Home Server which offers complete home network backup for all family Windows PCs. It’s available with 640Gb HDD. But storage capacity can be easily extended by connecting external USB drivers. The price of RIPNAS is not so cheap – €995.00. You can buy even semiprofessional solution with RAID support and many others options. IMHO it isn’t reasonable money for possibility to rip your CDs (and not DVDs). The lack of gigabit Ethernet is also not an advantage. 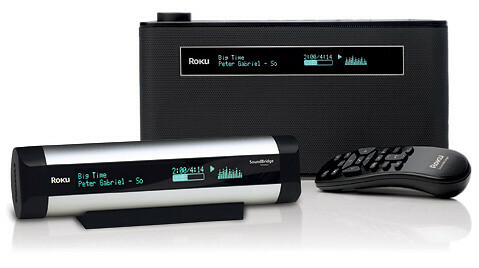 Sqeezebox together with SlimServer is the easiest way to create a multiroom music system. 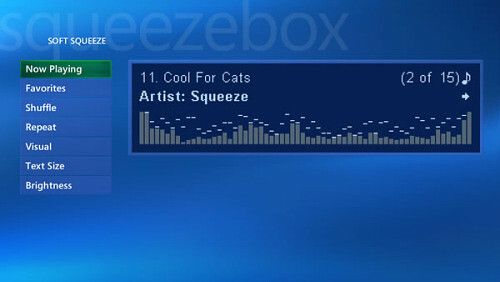 Now with plug-in mceSoftsqueeze it’s possible to use Windows MCE as a Softsqueeze – software emulator of real Sqeezebox. It logs into SlimServer (preferably installed on a separate networked PC) and can be managed directly from your Media Center’s 10-foot interface and remote in your entertainment area.